Mark was working with his hands from the time he was crawling as a baby. He is forever building and working with electronics. We are not talking about plug-and-Play. Mark designed nine pieces of electronic equipment that were manufactured by Zercom, now Nortech in Merrifield, MN. He also designed literally hundreds of one-of-a-kind electronic circuits used in radio broadcast stations across the country. Some found their way abroad. He designed and built it all with great determination for the broadcast industry. Mark loves going to radio stations to fix what is broken or install new circuits to make broadcasting the best that it can be. One sign on the back of his service truck reads "Radio Doctor." Another reads "So Many Transmitters, So Little Time." He really is dedicated to the industry that he grew up in. How many people do you know who have done the same thing their entire life? Mark didn’t happen into broadcasting. He was born into it. His father Charles B. Persons started in radio engineering in the 1920's. Mark knew in high school that he wanted to work in electronics and specifically in radio broadcasting as an engineer. While a teenager, he helped build a station. The only time he did not spend in broadcasting was during his stint in the U. S. Army. He taught electronics at Ft. Monmouth, NJ, and spent a year in Vietnam (1968 to 1969) as Sergeant in Charge of an avionics repair shop keeping the hi-tech OV-1 Mohawk surveillance aircraft in the air. Back in the states, Mark worked in his family-owned radio station until 1979 when he went on to be a contract engineer for many stations. This was a new field at the time. In total, he has built 12 new commercial radio stations, mostly in the Midwest. That included building phasors at four AM directional stations. Countless others were rebuilt or upgraded along the way. Mark installed AM Stereo at 40 radio stations back in the 1980's. Mark has written 150 engineering articles for national publications, mostly in Radio World. He has given twelve speeches before regional radio conventions, three at NAB conventions, and one at a national SBE convention. Mark is a Certified Professional Broadcast Engineer with the SBE (Society of Broadcast Engineers.) AM Directional and Computer Networking were added to his certifications. He served as Minnesota Frequency Coordinator for the SBE for about six years. Mark was a mentor to three radio broadcast engineers even before the SBE started a program to do that. He added one at that time. 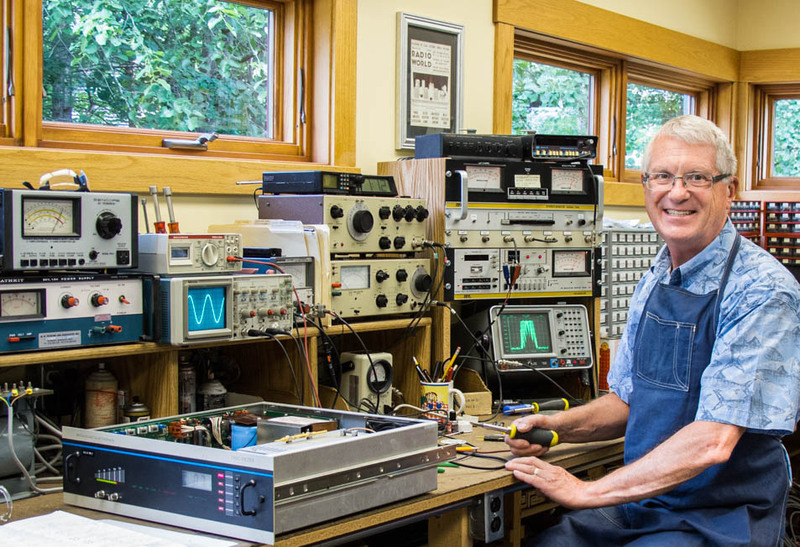 Mark is a constant inspiration to others and spends time almost every day helping other radio broadcast engineers solve transmitter problems. Amateur Radio (Ham Radio) was something he took up in 1963. His amateur call sign is W0MH. Mark is a life member of the Society of Broadcast Engineers, the American Radio Relay League, The American Legion, Veterans of Foreign Wars and Disabled American Veterans. November 9, 2018: Hi Mark. Was happy to see you recognized in the engineering community. Certainly well deserved. If there was ever a guy who "lived" radio broadcasting, it's you. Congratulations on a phenomenal career, and a life well lived.........so far. Doug Stromberg, Stromberg Technologies, Wadena, Minnesota. November 2, 2018: Mark: CONGRATULATIONS!!!! That’s prestigious. We don’t impress easily but this did it! Jerry and Cathy Collins, Lake San Marcos, California. October 25, 2018: Mark, Congratulations on the SBE award! Chuck Conrad, Texas Museum of Broadcasting & Communications, Kilgore, Texas. October 22, 2018: Hello Mark, Congratulations on your award. You certainly deserve the recognition for all your work and contribution to the industry. Well done. Paul and Teresa Hirst, Maidenhead, England. October 8, 2018: Mark: congrats on your well-deserved award. Tom McGinley, Market Engineering Manager, Townsquare Media Group, Missoula, MT. September 27, 2018: Hi Mark, I read your Radio World article on Power Generators (“The rest of the story”) with great interest. This subject would be very relevant, as a presentation for our SBE chapter Thanks and congratulations on receiving the Engineer of the Year award. Best regards, Art Lebermann, CPBE, W6REQ, Chairman, SBE Chapter 40, San Francisco, California. September 11, 2018: Dear Mark, I salute your life dedicated to our broadcasting industry. Your father would have been proud of your "Engineer of the Year" award. SBE made an excellent choice. You and I were the ones Frank Sinatra sang a song about " I did it my way." We just got things done. As my favorite movies title says, "It's a Wonder Life." It is for us both. P.S. Thank you for your service in The U.S. Army!!!! Richard Witkovski, Dallas, Texas. September 7, 2018: Hey Mark: Congratulations! Much deserved. Saw the article in Radio World today. Mark Anderson, Bemidji, Minnesota, engineer for Hubbard Broadcasting. September 7, 2018: Mark: I have been remiss in congratulating you on the SBE Flanders Engineer of the Year award! What a great honor and you are a very deserving of it! Congrats! Dave Cox, Brainerd, Minnesota, engineering contractor to Hubbard Broadcasting. September 6, 2018: Mark: Congratulations on being named “Engineer of the Year!" Shane Toven, K-Love Radio, Laramie, Wyoming. September 6, 2018: Mark, congratulations or being recognized by SBE! I hope all is well with you and Paula. The SBE is a wonderful group of people and you more than deserve to have them make so many people look at your picture. Bill Dahlstrom, Minnesota Public Radio Engineering. August 5, 2018: Mark – Congratulations on being named the SBE “Broadcast Engineer of the Year”. I have always admired your professional approach brought to the industry and have learned a thing or two over the years from your many industry articles. I look forward to offering my congratulations in person next month in Danvers, MA at the national meeting. 73 – Wayne N1WP, Texas A&M University – KAMU FM-TV, College station Texas. August 4, 2018: Hi Mark, I just wanted to take a moment to extend my congratulations on receiving the SBE Engineer Of The Year honor. It is well deserved and overdue! I hope all is well with you and Paula. Give her my best. Maynard Meyer, KLQP Radio is Madison, Minnesota. July 27, 2018: Congratulations on your SBE Engineer of the Year Award! Jim Offerdahl, Fosston, Minnesota. July 27, 2018: Hello Mark and the woman behind the prize... the lovely Paula. In case I did not make it abundant clear, congratulations to the two of you ... well deserved, too long delayed. Charles Fitch, Avon Connecticut. July 27, 2018: Big-time congratulations, Mark! Wow! Paul McLane, Managing Director of Content for Future Media Radio World Magazine, Alexandria, Virginia. July 31, 2018: Mark: Congratulations to you and Paula on your winning the SBE Engineer of the Year Award! You are well deserving of this honor. I include Paula in the congratulations because she has been the "silent partner" in your activities for many years. It's been a pleasure to know you and work with you during your career. Steve Brown, Chief Engineer for Woodward Radio Group, Appleton, Wisconsin. July 30, 2018: Just heard about your award, Mark. Congratulations to you! Warmly, Dave Richards, WOON Radio in Woonsocket, Rhode Island. July 30, 2018: Congratulations Mark on the Engineer of The Year award.. But really, it should have been engineer of a few "Decades" for all the top notch and hard work you put in to the industry and the many engineers (including me) you inspired! You also "taught" so many owners and managers how to "do it right" (defined as "correctly") the first time too! Hope you and Paula are enjoying the fruits of all both of your hard work in retirement and for wish you many more years ahead to enjoy! Del Dayton, radio broadcast engineer in Eau Claire, Wisconsin. July 30, 2018: Hi Mark, Congratulations on winning SBE Engineer of the Year!! Tom Vernon, contributor to Radio World Magazine, Carlisle, Pennsylvania. August 10, 2018: Hi, Mark: Just saw the announcement about your award from the SBE. A well-deserved honor. I hope you and your wife are well, and hope we'll cross paths again at NAB, if not before. Best regards, John Kean, Kean Consultants LLC, Falls Church, Virginia.